I’m a little late on this review, but who cares. These are still available and still kind of easy to find. I just couldn’t fit it in with all the craziness going on during the holidays but today I sat down to fire up Viaje’s Christmas Tree. 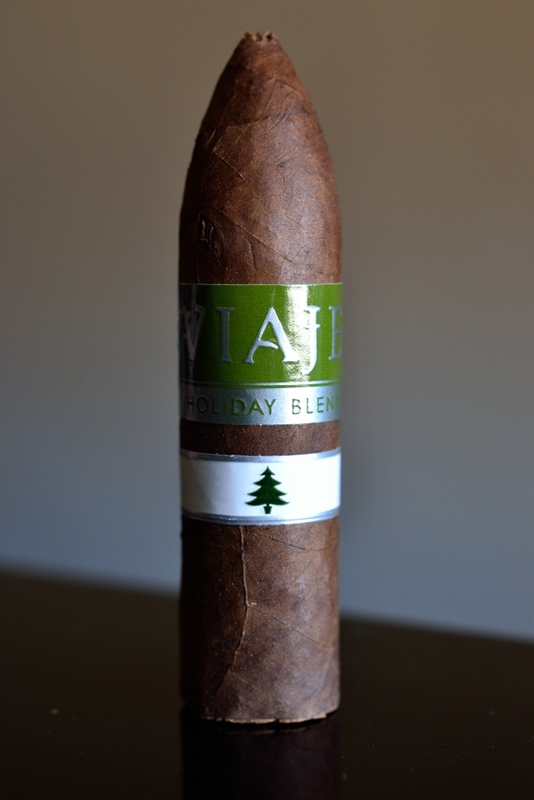 The Good Stuff: Andre Farkas of Viaje has been creating his holiday blend every year since 2009. I’ve had the pleasure of smoking most of the releases and I look forward to the release each year around Christmas time. Usually I find that Viaje’s cigars sell out relatively fast, and are hard to find but that hasn’t been as much of the story as of late. Heck, I can even find these locally as I picked this up at Old Fort Bliss Cigars here on base in El Paso. 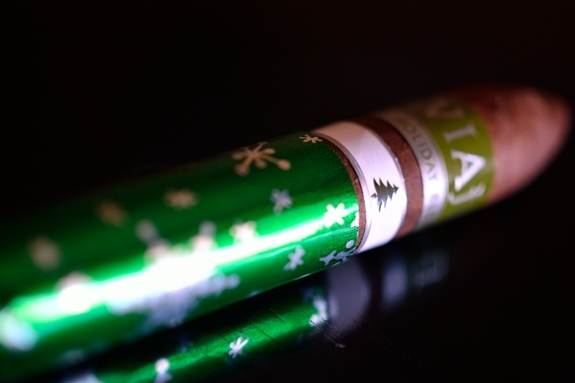 The Holiday Blend Christmas Tree is a Nicaraguan Puro sporting a Nicaraguan Criollo wrapper. The Christmas Tree comes in one size a 4 x 60 torpedo packaged in boxes of 20 priced at $204.00 a box with only 400 boxes released. Prelight: The Holiday Blend Christmas Tree comes with its own wrapping. 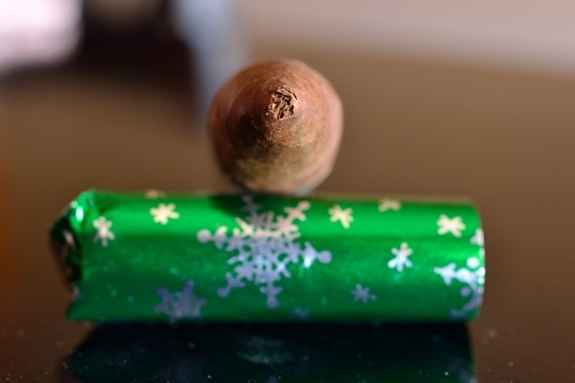 The cigar is covered with a metallic green and silver snowflake patterned wrapping paper. 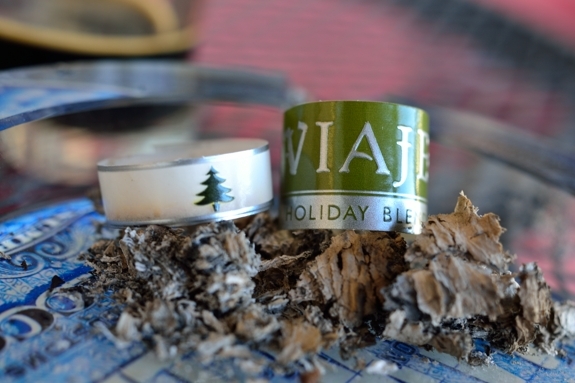 Underneath the wrapping paper you will find a standard silver and green holiday blend band with a secondary white band with nothing but a little green Christmas tree printed on it. The cigar itself is a stalky little thing. I haven’t seen this vitola in use much with the exception of some of the nub blends. 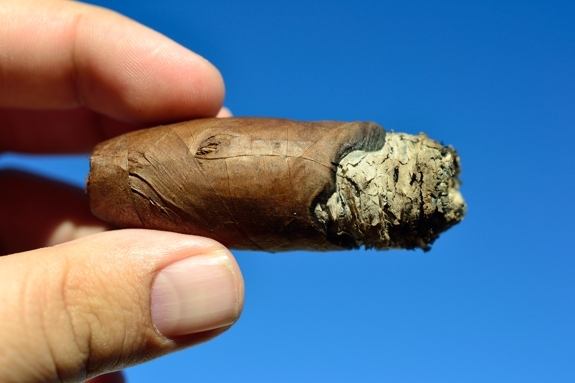 It’s a thick, and very hard cigar. It actually feels like a little cylinder of cement in terms of weight and density. The wrapper is a very dark brown with some awesome darker/black webbing throughout the leaf. The Christmas is polished off with a long, sharp, torpedo. The construction on this cigar is great as the wrapper leaf is laid seamlessly with absolutely no soft spots at all. 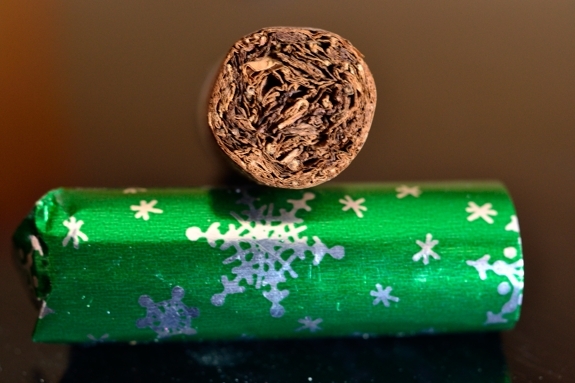 The wrapper on the Christmas Tree gives off nothing but a slight tobacco and chocolate aroma while the foot of the cigar has some pronounced pepper mixed in with earthiness. The cap cut clean and easily using my Palio double bladed cutter. The cold draw kicks out a ton of black pepper, chocolate, and coffee flavors. First Half: Due to the format of this smoke I decided to break it up into halves instead of thirds. The Holiday Blend Christmas Tree starts as expected with a ton of back pepper on the front finishing with a bit of sweet chocolate, coffee, and some syrupy raisin. The draw on this cigar is insane! Every little puff just pumps out huge clouds of thick white smoke. It’s a small cigar, but I could see myself really taking my time with this one. The burnline is thin, and steady with only some very slight waves. The ash left behind is pretty flaky in some areas, compact in others while sporting a dark and medium grey color. 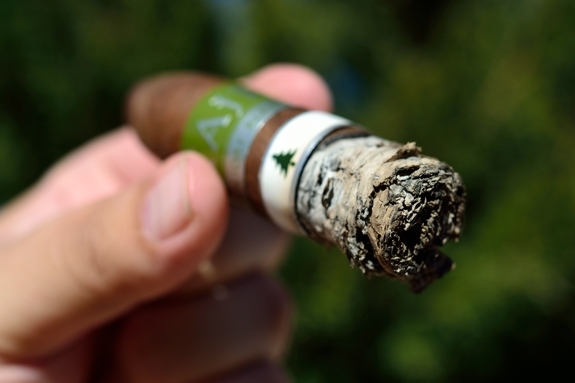 The ash held on until it hit the secondary band when I tapped it into my ashtray. I am starting to feel a bit of the nicotine, but not a whole lot yet. Final Half: Into the second half of Viaje’s Holiday Blend Christmas tree and the raisin flavor I picked up in the first half has become much more pronounced and it leading the flavor race with some great chocolate/cocoa flavors, coffee, and spice. The black pepper held it’s own but finally dropped out of contention as I reached the halfway mark. The retrohale is very, very sharp and full of strong pepper. I won’t be doing much more of that with this cigar. The cigar finished very strong, and smooth with lots of flavor. It took me a little over an hour to take it down to the nub and left me with a great little nicotine kick. The burnline got pretty thick and real rough and wavy into the second third. I tried to keep up with it as it required quite a few touch ups from my lighter. Overview: The cigar was great. My biggest issue was the size/shape. 60 ring gauges aren’t very comfortable to begin with. Adding a torpedo cap made it a bit easier on the mouth, but the stubby nature of the cigar made it kind of clumsy in my hand. The construction on the other hand was suburb. The flavors were great, and the strength was strong and right up my alley. That being said, I just think that the $10+ price tag that comes with this cigar is pushing the absolute limit of what I would pay for it. I understand it’s limited, and a special occasion cigar. I just don’t see myself buying very many of these to keep around. I find that it’s always a bit of a toss up with Viaje. Sometimes I feel their blends far exceed my expectations and others fall short. The Christmas Tree is right in the middle. Pairing: After this disgusting display of hockey from my Devils this weekend, I had to take on something bold to snap me out of it. Prairie Artisan Ales’ Prairie Bomb! Fit that role perfectly. In all honesty, the Prairie bomb! Is probably one of, if not the best stout I have ever had in my life. Prairie Bomb! Is a 13% or 14% ABV Imperial stout aged on espresso beans, chocolate, vanilla beans, and ancho chili peppers. Doesn’t that sound intense? Well it is. First of all, the reason why I state 13% or 14% is due to some information found on the web. Everything states “14%” including one of the bottles I have. But for whatever reason this bottle in particular says “13%”. Why the mix up? Who cares, it tastes great. The vanilla and chocolate are very pronounced making an awesome sweet, thick, and smooth stout while the espresso and chili are only really evident on the nose and the aftertaste adding a great change up to each taste of the beer. The first time I tried this beer I was scared that the chili would add too much spice to the flavor profile, but it’s so mild that all it does really is add a bit of bite to the after taste. Now think about that. Spice, espresso, vanilla, and chocolate. I can’t think of a better combination to pair with this cigar. 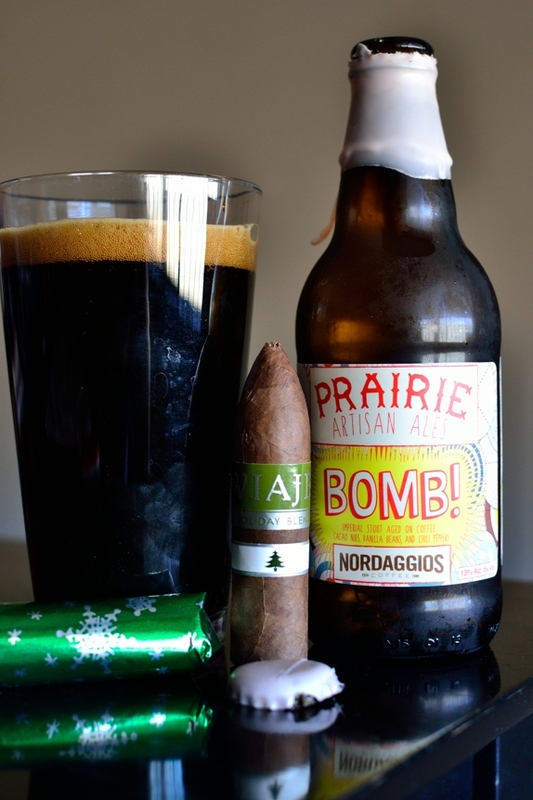 A big plus was that the beer was so full flavor that even while the cigar was full bodied, it really anchored the flavor and pulled the body of the cigar up even higher than it already was. Ok I may get spanked for this but I have had a few of Viaje lines and None of which I was impressed with, couple that with them being hard to find in my area and the high $ tag on their sticks I always pass them by when I do see them. Not sure maybe its me but Viaje just doesn’t do it for me. You’re not alone. I like Viaje, however I like most of their core lines and not so much the limited runs they put out. I know quite a few people who love them cause of the exclusiveness or the blends and I know quite a few who hate them for it.